CARFAX 1-Owner. XLT trim. Third Row Seat, Leather, iPod/MP3 Input, Satellite Radio, Bluetooth, CD Player, Smart Device Integration, Flex Fuel, EQUIPMENT GROUP 201A, CAMEL, LEATHER-TRIMMED FRONT BUCKET S... Hitch, Rear Air CLICK ME! Third Row Seat, Rear Air, Flex Fuel, Satellite Radio, iPod/MP3 Input, Bluetooth, CD Player, Trailer Hitch, Aluminum Wheels, Smart Device Integration MP3 Player, Rear Seat Audio Controls, Privacy Glass, Keyless Entry, Child Safety Locks. EQUIPMENT GROUP 201A Driver Vision Package, Rear-View Camera, Rain Sensing Wipers, XLT Premium Package, Pale Adobe lower bodyside cladding and wheel lip moldings, 110V AC Outlet, Woodgrain Interior Trim Accents, Pale Adobe Metallic Trim, bumpers, wheel lip moldings, running boards and lower bodyside cladding, Leather-Wrapped Shift Knob, Dual-Zone Electronic Air Temperature Control, 10-Way Power Driver Seat, Heated Black Power Mirrors w/Spotter, signal and memory, Memory Package, memory driver seat, mirrors and pedals, Power Liftgate, 3rd Row 60/40 PowerFold Split Seat, Subwoofer, 6-Way Power Passenger Seat, CAMEL, LEATHER-TRIMMED FRONT BUCKET SEATS 8-passenger seating, 10-way power driver seat. 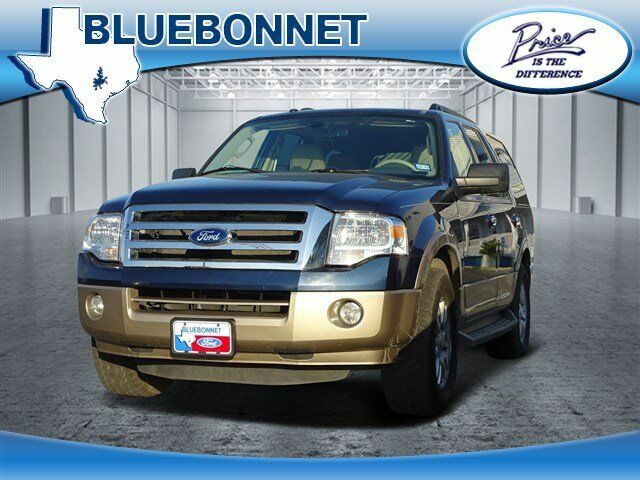 Ford XLT with Blue Jeans Metallic exterior and Camel interior features a 8 Cylinder Engine with 310 HP at 5100 RPM*. KBB.com explains "With room for up to eight people and a tow rating up to 9,200 pounds, the Expedition bests every other full-size SUV in its class. ".